Remember when I said that All-Stars is the best season in terms of visual jokes and facial reactions? Well this is one of the best. In fact this one doesn't even need a writeup. All I have to say is that the best moment of All-Stars episode one is when the three tribes finally "meet" one another and see the people that they will be playing against. It is a tremendously exciting moment for everyone in the cast, and it is one of the few scenes in All-Stars that will literally send chills down your spine. It truly is a larger-than-life exciting All-Star moment. Well, unless you are Colby. Why doesn't Colby enjoy the moment like everybody else? Well, simple. It's because he isn't particularly thrilled to see that Jerri (his old nemesis from Australia) is a member of Saboga. 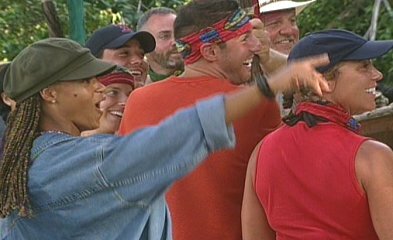 Check out the look on Colby's face when he sees Jerri come walking out of the jungle. He could not possibly be less enthused. Here come the All-Stars! And Amber! The Sabogas arrive. And Jerri is thrilled to see her old nemesis, Colby. Colby's reaction always cracks me up. Crap. Jerri. Ugh. Great moment. Too bad that it happens so fast. If you aren't looking very close, you are likely to miss it.